The Horse published this handy article about keeping your horse healthy and happy during transport. Dr Lydia Gray DVM the vet consulted for this article is a good friend of ours! Due to our changing commitments in Ontario and the sale of our tractor trailers we will no longer be offering shipping to the United States. We look forward to serving your Ontario transportation needs! FAQs - Should I Wrap for Shipping? Here at BWD Equine Services this is one of our most frequently asked questions! Has your horse worn wraps before? There is no point in putting something on them that is unfamiliar. Trailering can be a stressful event for horses without adding another unfamiliar element. If the horse panics because they are not used to wearing wraps, you can end up with a very preventable injury. Do they fit? Can you put them on properly? This is also important. Putting wraps on poorly or that are ill fitted can create other issues while shipping. The last thing you want is for your horse to get their wraps partially off while shipping. It is not safe for handlers to climb into single stalls under horses to unwrap a poorly wrapped horse. This situation can cause injuries to both the horse and the handler. 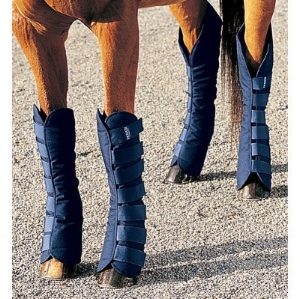 If they don't fit, or you can't put them on properly, you are better leave your horse unwrapped. Is your horse travelling alone or with company? If your horse is on a trailer with other (usually unfamiliar) horses in standing stalls that are open at the bottom you should definitely consider wrapping your horse. There is no way to know if the horse travelling beside yours travels well and they could easily scramble or kick out under the dividers. Best practice is to make sure that your horse travels with ample space to avoid this situation. Due to our commitments in Ontario throughout the year we will no longer be offering co-load options into the USA. If you require a private charter we are happy to assist! BWD Equine Services Farrier Division is excited to announce a new partnership for 2016. We will be providing all of the onsite race day farrier services for Ajax Downs for the 2016 race season. We are all looking forward to this new adventure! Thank you to the folks at the Ontario Racing Commission and Ajax Downs for the opportunity. How many years have you been transporting horses? How often do you stop for food and water? What will you do if my horse has a medical emergency? How often will you contact me during the trip? What do you do for overnight trips? How can I best prepare my horse for transport? What supplies should I pack with my horse? We are constantly working to raise the bar on our services. If you have any questions or concerns about your experience, please let us know. We'd love to chat with you.